Bunglows on Rent,Hotels in Guhagar,Delicious Veg and Non- Veg Food in Guhagar. Shiva had remained hidden. Guhagar means land full of heards of cows. etc. are worth watching here.! 6 kilometers! Located on the Western coast of India, it is at a distance of 280 kms or about 5.5 hours’ drive South of Mumbai just off the Mumbai Goa national highway. Guhagar Beach - Guhagar beach is one of the cleanest beaches in Maharashtra. It is located just within 200 meters from Guhagar S.T. Depot towards west. Now, chat stalls have started making business on the shore. Shri Vyadeshwar Temple - Approx 1 km from villa. 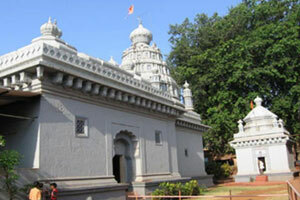 Shri Dev Vyadeshwar is a Hindu temple dedicated to the God Shiva. 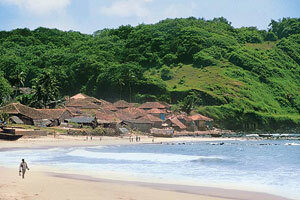 It is located in Guhagar, Ratnagiri District of the Indian state of Maharashtra State. It is considered the Kuladevata (Clan God) of many Chitpavan families from the Konkan region. Velaneshwar - Approximately 25 KM south of Guhagar, along Guhagar-Hedvi road, is located this beautiful temple of Lord Shiva. The temple is right on the pristine sea shore. This temple is Kuladaivat of lots of Kokanastha Chitpavan Brahmins. (Surnames like Gokhale, Raste, Dev, Gadgil, Tulpule). There are smaller temples of other gods like Shri Vishnu, Ganesha, Kalabhairav around the main temple. Hedvi - Hedvi is a small village located at approximately 27KM along Guhagar-Narvan road, towards south of Guhagar. This small vilalge is yet another popular location around Guhagar that boasts of some places worth seeing. Most famous is the temple of Dashabhuja (10 Hands) Ganapati. This temple dates back to age of Peshwas. The idol of lord Ganesha is carved in marble and is supposed to be from Jammu-Kashmir. The temple is recently renovated and is very clean and simple. Budhal - The sea shore of Budhal offers pure serenity. This small town is located around 5 KM from Village Adoor Phata along Guhagar Hedvi Road. The town is scantily populated - hardly 40 houses. The approach road terminates at a spot that offers commanding view of the entire Budhal village and the rough rocky sea shore it has. Enron Project at Dabhol - Along Guhagar - Veldoor road, near Anjanvel, this is a project of electricity generation from gas. One can see 70-80% of this project while traveling along the road. 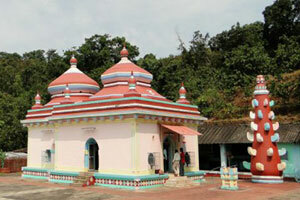 There is also very famous Chandika Devi underground temple at Dabhol. Gopalgad / Anjanwel Lighthouse - This ancient fort is located near Anjanvel - 11KM North of Guhagar, along the coast line. It is believed to be built at the start of 16th Century by the Siddis. It was captured by Shivaji Maharah in 1660. What remains today is the huge fort that spans 7 Acres of land. Mody Villa offers luxurious holiday home, variety of meals, excellent natural beauty, guided short tour programme covering wonderful surrounded places, visit to attractive Holland technology floricultural park and traditional shopping from local villages. Varcha Paat, Guhagar Veldur Rd., Guhagar Dist., Ratnagiri - 415703. Maharashtra - India. © Copyright 2018. All rights reserved. Mody Villa.